Born and raised in the small village of Cap Pelé, Jeannot decided to pursue his education at NBCC Moncton in Civil Engineering Technology. 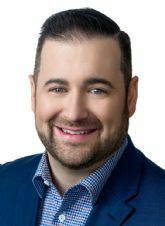 After graduating from NBCC, Jeannot moved to Moncton in 2007 to start his career in the construction industry as a project manager working directly with Contractors, Architects and Engineers. Jeannot gained valuable experience in the residential and commercial sector. Jeannot has since received his PTech designation and Gold Seal Certification from the Canadian Construction Association. Coming from a family that naturally strives in customer service and sales, it was only right for him to combine the two and transition into Real Estate. Jeannot has decided to join a very knowledgeable and experienced team at Exit Realty. His very approachable personality will always make you feel at ease throughout your Real Estate Experience. Allow Jeannot’s experience and passion help guide you with your real estate needs.